As the EU re-evaluates its relationship with China, its top brass heads to Paris today to meet with President Xi Jinping. The gathering with Emmanuel Macron, Angela Merkel and Jean-Claude Juncker comes at a tricky time for Sino-European relations: the EU is under immense pressure from the U.S. to restrict the use of Chinese equipment in next-generation mobile networks and wants Beijing to commit to completing a trade accord removing barriers for European companies. But the bloc is also acutely aware that China can be an important strategic ally, not just in terms of investment, but also on key issues like climate and multilateralism. Taking Back Control | The U.K.’s House of Commons voted last night to strip power away from Theresa May over what happens next in the Brexit process. This paves the way for Parliament to demand she pursues radical Plan B options, potentially including a second referendum, keeping the U.K. in the EU’s customs union, or even canceling Brexit. Cyber Measures | The EU is set to urge members today to exchange information to manage the cybersecurity risks of 5G wireless networks, side-stepping U.S. calls to ban Chinese equipment makers like Huawei. The proposed measures are aimed at coordinating a European approach to cybersecurity threats, following allegations that Chinese companies could enable spying by Beijing. Times A-Changin | The European Parliament aims today to advance a plan to end seasonal clock changes in Europe. While the assembly will vote on a recommendation to cease the decades-old practice in 2021, when EU governments would have to choose between permanent summer or winter time, the fate of the law is uncertain as national capitals grapple with it. Copyright Compensation | Google and Facebook would need to compensate countless creators for user uploads of their content under new copyright rules set to be backed by the European Parliament today. The vote is seen as a formality after institutions agreed the rules in February, but all sides have been lobbying lawmakers until the bitter end. Diverging Fates | Italy’s Matteo Salvini scored the latest in a series of wins in a regional vote, while another dismal performance by his national government partner cast doubt on the future of the fractious populist coalition. The victories have triggered speculation that the League leader could seek to force early elections to claim the prime minister’s post. Qatari Hurdle | Deutsche Bank is facing resistance from top Qatari shareholders to its merger plans with Commerzbank. The discontent of key investors, who worry their holdings will be diluted, adds to widening opposition to the deal, which the German government sees as way to ensure financing to the country’s export-oriented economy during a downturn. Just Don’t Do It | Nike was fined 12.5 million euros by the EU for preventing sports merchandise being sold in different countries, a move aimed at keeping prices high in some markets. The probe is one of several aiming to crack down on online sales curbs that may hamper how goods are traded across Europe. Fewer Polls | The European Parliament abruptly scaled back its plan to publish regular forecasts of upcoming EU election results after most of the assembly’s political groups expressed objections. The body intends to release only two — rather than seven — more projections of the 705 seats to be held by political parties after the May 23-26 ballot. German Relief | Confidence among German companies unexpectedly improved in March, providing a glimmer of hope for the eurozone economy, which has been hit hard by rising trade protectionism and a slowdown in China. The more upbeat data suggests Europe’s largest economy may be starting to find its footing following earlier weakness. As the share of Group-of-20 economic output controlled by populists and non-democratic regimes rises, there are increasing signs that bad policies are hurting growth. 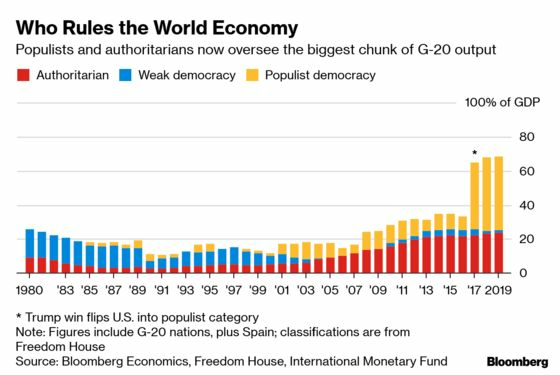 Based on Bloomberg Economics’ classification, 68 percent of G20 GDP is under the governance of either populist rulers in democracies or non-democratic regimes — that’s up from 65 percent in 2017 and a jump from 33 percent in 2016.